“Ecology (from Greek: οἶκος, “house”; -λογία, “study of”) is the scientific study of interactions among organisms and their environment, such as the interactions organisms have with each other and with their abiotic environment” [Wikipedia: Ecology]. Human Plant Interfaces are mostly based on the living organism of a plant. These living organisms will interact with its environment as animals or humans do. It is important to understand these relationships for keeping the plant and its environment alive. Moreover, some of these interactions create an added value for Human Plant Interfaces. The goal of this chapter is an introduction to plant ecology in relation to Human Plant Interfaces. It will introduce the topics primary environmental factors for plants, the basics of beneficial relationship between animals and plants, and human involvement in this ecosystem. A complete treatise about plant ecology is beyond the scope of this thesis. The book “The Economy of Nature” by Robert E. Ricklefs (2000) presents a more accurate insight of natural ecosystems. A plant needs several factors for its sustainable living. The primary components are soil, water, humidity, air, light, and moderate temperatures [Kastner2012, page 176]. How the plant system uses these elements was described in the previous chapter “Plant Physiology” in detail. Beyond that plants are not a one way system. Among the consumption of the environmental resources, plants are a vital source of products for its environment. For instance, plants are able to convert carbon dioxide (CO2) to oxygen through Photosynthesis, which is one of the most important energy resources for all livings on earth. Moreover, plants are able to clean and preserve the soil. For example, extract high concentrations of metal from the soil [Kastner2012, page 175]. The plant can be recycled or destroyed afterwards. Their protection function is another important benefit of plants for their environment. Bigger plants provide a secure place against strong wind, sun and in some cases hot temperatures. Plants, animals and humans profit equally from this natural support [Whyte1980, page 46]. The most common beneficial relationship is the resource – resource relationship. Animals and plants exchange directly their chemical and physical resources. For instance, a fungus gives nutrients for a plant and the plant provides a habitat and nutrients for the fungi. Another great example of a resource – resource relationship between animals and plants is the ecosystem approach of Aquaponics. The excretions of fishes supply enough nutrients for the plants to live, and the fish gets its complete food chain provided by the plants. A service – resource relationship is very common between plants and insects. For example a plant provides sugar (resource). Ants will eat the sugar from the plant and in return they defend the plant against herbivores (service). Another service–resource relationship is the phenomena Zoochory. Animals eat the fruits of a plant and secrete the plant’s seeds at another place. The topic of seed dispersal will be explored in chapter “3.3. Locomotion applied to Plants for Public Spaces” on page 73 in more detail. As reported by Wikipedia, the service – service relationship appears very rarely in nature. Even after more accurate investigations, a service – service relationship is very often based on a service – resource relationship. After all a service – service relationship is an exchange of actions between different living organisms. For instance, the relationship between a clownfish and an anemone is assigned to a service – service relationship. The anemone provides the clownfish a hiding place, and in return the clownfish defends the anemone against other fishes. Humans and Plants have a more complex beneficial relationship to each other. Food delivery by plants is for humans as important as for animals. The big difference to animals is the human invention of agriculture. Several thousand years ago, human started cultivating plant growth for their food demand. Food production is not the only motivation for humans to grow plants [Kastner2012, pages 163 + 164]. The farming industry produces plants for a huge range of products. Wood as a construction material is one of the most obvious needs, but textile production is also a very important one [Flagler1994, page 4]. Beside of these pragmatic uses of plants, humans also involve plants extensively for their medical treatments. Until today, plants are an important resource for pharmaceutical products. In relation to all these mentioned human demands that plants fulfil, intensive agriculture and the growing amount of monocultures has changed our infrastructures of the natural ecosystem massively. Unfortunately, the transformation of our natural landscapes and the exploitation of the natural resources hold disadvantages for the human kind as well as for all other organisms on earth. Natural environments have a critical relaxing and calming impact on the human mind, which is often associated with human well-being [Kob2010, page 5]. For this reason and in relation to the long-term of the earth, the destructions of natural environments caused by humans must be avoided. Agriculture is not the only destruction force against natural ecosystems. The tourism industry is still increasing and has a big harming impact on our natural landscapes, too. “The goal of HCBI is to achieve a feeling of belonging to nature without causing environmental destruction and going there” [Kob2009]. According to him, humans should be separated from natural landscapes, because their impact is too negative on an ecosystem. He implemented several audio-visual devices that enabled humans to interact with a natural environment without being there. His installation “Wearable Forest” will be introduced in chapter “3.5. Experimental expressions in relations to plants” on page 96 and explains the concept of human interaction with a natural environment more accurate. Regarding to this thesis, the framework “Human Computer Biosphere Interaction” provides a clear scope for Human Plant Interfaces in context of a natural ecosystem. Furthermore, it implements a documentation framework how the complex interactions of living organisms within such a natural ecosystem can be connected with the domain human computer interactions. Plants are an essential part of these emerging interactions and therefore this framework takes over a critical role for mentioned projects in chapter 3. [Whyte1980] Whyte, William H (1980). The Social Life Of Small Urban Spaces. Project for Public Spaces Inc, 1980. An interesting photos series how plants (e.g. trees) reclaim back their environment. Another great example for this are the photos by Jane Qing of an abondoned Chinese Fishing Village close by China’s Yangtze river (Shengsi). Leonie Fischer is a researcher from the Technical University Berlin and explores the relations between plants and urban environments. Her publication list looks very promising and is surely a great knowledge resource. The same is valid for the EU research project Green Surge. Another interesting article about how dead trees provide their left over nutrients to their living neighbours and support the existence of the wood wide network. 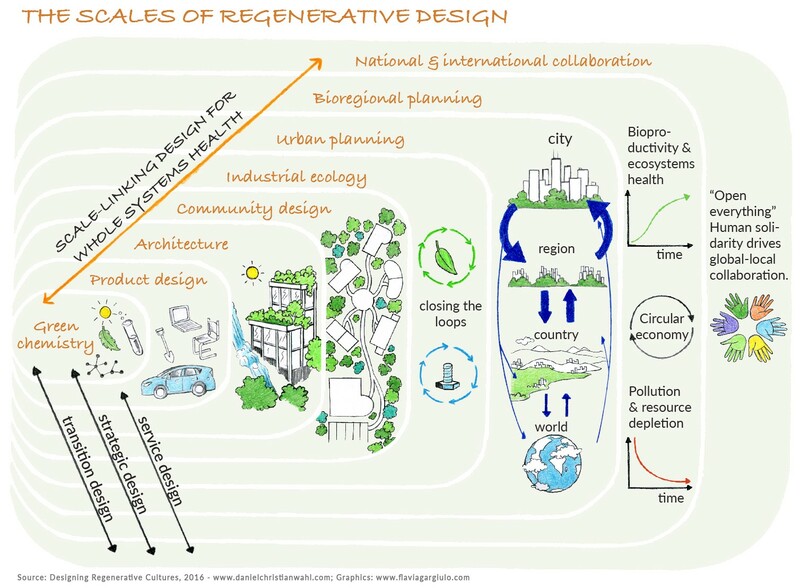 Another great layer based description of an ecological system is provided by Designing Regenerative Cultures. The book explores and describes the importance of the scales of design and scale-linking design from green chemistry, to Product Design, to Communication Design, to Industrial Ecology, to Bio-regional planning, to National and International Collaboration.